The Teton River forms at the confluence of the North Fork Teton River and South Fork Teton River, just to the east of the Rocky Mountain Front. 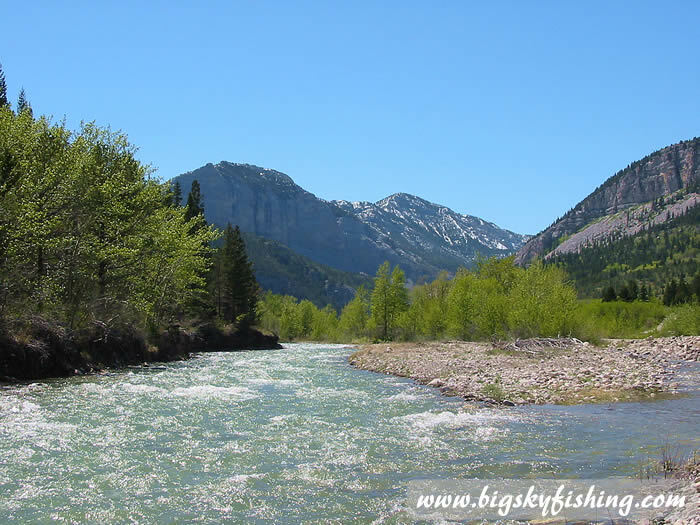 The Teton River has several forks that begin high in the mountainous country in and around the Bob Marshall Wilderness Complex, all of which offer excellent recreational opportunities in addition to fishing. From its origin, the river flows for more 195 miles to its confluence with the Marias River near Loma, Montana. Throughout its length, the river twists and turns extensively through a combination of high prairie and small canyons in a very remote area of the state. Except for near its origin and along its upper forks, the Teton River has difficult access since it flows primarily through private lands. The upper forks of the Teton River (North, South, Middle and West) all originate in the mountainous country in various points east of the continental divide. The country is a combination of high mountains that are a mix of grass, rocks, alpine and trees. Access to all of these forks requires hiking or packing in, as road access is only possible along short stretches of the North Fork and South Fork. Numerous excellent hiking trails provide access to each of the forks. As the country is quite open, bushwhacking off trail is also relatively easy. The fish in the upper forks of the Teton are generally small but plentiful. Fishing pressure is very low, and the fish, consisting of primarily rainbow, brook and cutthroat trout, rise willingly to most dry flies thrown their way. Numerous deep pools, riffles and runs are found all along the forks. Several beaver ponds also provide for interesting fishing possibilities. The bottoms of the forks are primarily gravel and rock. It is a very long way to anywhere from these forks, so any angler venturing out here should be prepared to camp, either in the mountains or car camping along Canyon Road, which parallels the North Fork Teton River for a short distance. Numerous camping sites, both official and unofficial, are readily found. Floating on the North Fork Teton River can begin, at least during high waters, near the end of Canyon Road. More consistent floating conditions will be found below the confluence of the North and South Fork. When floating the North Fork, several beaver ponds and a mix of rapids, pools and riffles all will be encountered, which combined with the scenery makes for a scenic and enjoyable float. The Teton River itself does not flow through the mountains, as it is formed a short stone throw away from the eastern most mountains that form the Rocky Mountain Front. The Teton River in this section has extensive gravel beds. Except for right along the river itself, the countryside is devoid of trees, as it flows though the wide-open Montana prairie. 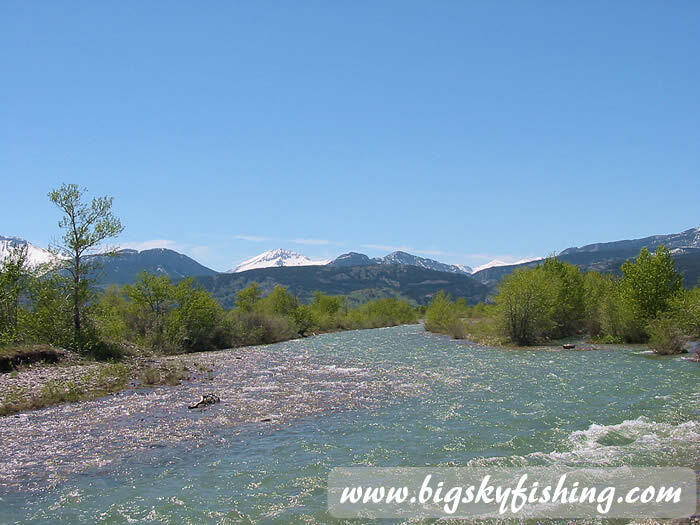 Due to its location along the Rocky Mountains, high winds are common and can play havoc when fly casting. The fishing on this section of the Teton River is generally poor. While the river has a wide variety of fish species in this section, including rainbows, cutthroats, browns and whitefish, its grayish-gravel streambed, low nutrient water and irrigation demands, all combine to create a relatively poor fishery. However, some decent fish, particularly brown trout, can be taken in the rivers few deep holes and around obstructions using streamers. Floating this stretch of the Teton River is excellent. The river has a moderate current, and the scenery is outstanding as the Rocky Mountain Front fills up the western skyline. Several diversion dams exist, all of which need to be portaged. For a floater wanting to avoid the diversion dams, the best put-in spot is below the Eureka Reservoir Campground, which is located eleven miles upstream from the town of Choteau. Access to this stretch of the Teton River is fair. While the river primarily flows through private lands, a number of road crossings allows for adequate access. Below Choteau, the Teton River has a mix of moderate and slow current. The river also twists and turns extensively through this stretch. The Teton River in this stretch generally is generally muddy, due to its muddy and sandy bottom. Except for along the river, the countryside is basically devoid of trees, flowing through the rolling hills of ranch and farmlands. As the Teton River frequently flows through a shallow canyon that is readily visible from many miles away, views of the ranch and farmlands are somewhat infrequent. The Teton River changes from a cold-water stream to a warm water fishery between Choteau and the Marias River. The upper twenty miles of the Teton River near Choteau has some fair fishing for brown trout, using streamers right along the banks. Hoppers also can be used successfully, floating them either along the banks or right down the middle of the river. 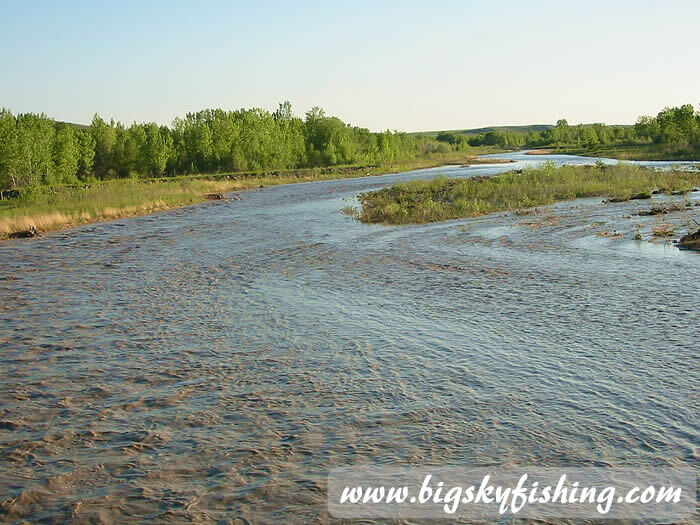 As the river travels further east from Choteau, though, the water warms significantly, with pike, catfish and other bottom fish becoming the predominate fish species. The countryside becomes very remote and isolated as the Teton River nears the Marias River. Access points are scarce, and the few county road bridge access sites are difficult to find since the roads are frequently unmarked or unnamed. For a floater wanting a float full of solitude, the lower half of the Teton River is an excellent choice. Listed below are selected river miles on the Teton River, from its origin to its end at the confluence with the Marias River.